How To Get Rid Of Toenail Fungus Fast? Finding solutions on how to get rid of toenail fungus could be very easy to find on the internet for people who are desperately in need of its solution or cure. However, there are malicious tricksters who take advantage of vulnerable patients, and then exploit them to increase the profits of their businesses. We have to admit that not all problems patients face have sizes that fit them all, so people with these problems have to test several solutions to determine its efficacy. It seems that everyone has a piece of sage advice to offer about how to get rid of toe nail fungus. Some advice is very simple: apply Vicks VapoRub, Listerine, tea tree oil, or any one of a dozen other substances. Other remedies take more effort, like soaking the affected toenail(s) in a solution of dilute bleach, hydrogen peroxide, vinegar, Listerine, or some other chemical for a period of time each day. Then, there are the doctor recommended medications: topical ointments nail lacquer, or oral drugs. These treatments are easy, and may have stronger scientific backing, but they are by far the most expensive. Pick any method for getting rid of finger nail fungus, or any advice on how to get rid of toe nail fungus. If you do any reading, you will quickly discover that all methods are fickle. VapoRub works for some and not for others. Stories of success with a vinegar soak abound; so do stories of failure. Some lucky people report success in weeks; some stress that you may have to keep at it for a year or more. Even the prescription medications have a relatively poor success rate. The bottom line is that curing nail fungus infection is difficult. The best advice follows a four step approach. First, see your doctor to get the diagnosis confirmed – other things can look like nail fungus that aren’t. Talk to your doctor about treatment options. Second, if you are reluctant to take any of the prescription medications, like many people, or if you simply want to learn about other ways of treating nail fungus, consult a natural healing professional or do your own research. The third step is to choose a treatment. Any advice on how to get rid of toe nail fungus will probably work just as well for getting rid of finger nail fungus. Remember, that any of the choices could have unpleasant and unintended side effects, and none are as foolproof as their proponents claim. Finally, stick with it. All types of nail fungus treatment take time to work. Some people might experience negative side effects from purchasing toenail fungus treatment over the counter, but it is very rare occurrence. If you are afraid of side effects, it is strongly recommended that you go for natural home treatments for toenail fungus. 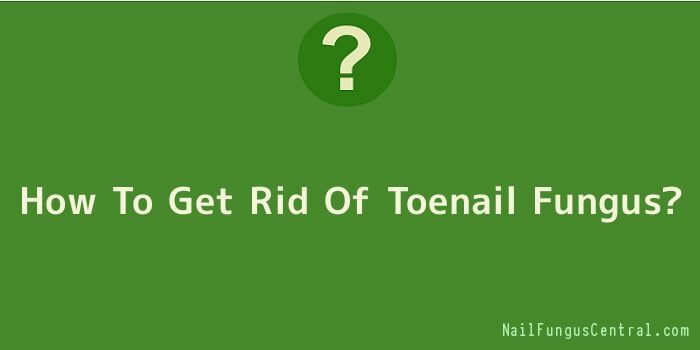 It is just as effective in getting rid of toenail fungus. At alternative times, the condition can develop as results of a compromised immune system. As an example, patients, who are diabetic or HIV positive can notice that they suffer from bouts of the condition. In order to urge rid of toe fungus, the patient must treat the underlying condition. Within the case of diabetes, it’s advisable to follow a suggested diet still as taking insulin supplements. For people that are HIV positive, anti retroviral treatment is a part of the holistic resolution to their issues. They’ll even be given topical or oral remedies by their clinician. The opposite sensible measures like keeping the feet dry mustn’t be forgotten. Additionally patients are suggested to stay the toenails clean and trim. Style aware patients ought to avoid nail polish unless it’s treated. As a result of untreated nail polish can offer cowl for the fungus. Podiatrists are highly trained professionals, who are able to provide recommendation to patients, still as arranging for prescription treatments for the conditions that patients are laid low with. Thus, their recommendation mustn’t be forgotten. They’ll file the fungus and acquire rid of a number of the visible signs that there are issues with the toes. It’s additionally attainable for them to convey the patient medicated nail polish that may be a helpful piece of armour against toe fungus.